Sticking with the brand's long-standing tradition, 2011-12 SP Authentic Hockey has tons of ink in its Sign of the Times insert set. 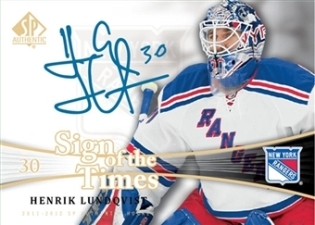 Upper Deck has confirmed groupings and short print info for both the regular Sign of the Times autographs and the dual-signature Sign of the Times 2 cards. Overall, Sign of the Times cards fall 1:41 packs. Dual-autograph Sign of the Times 2 cards are inserted 1:288 packs and are considered a case hit. Collectors can also look for Mystery Redemptions, which are good for a dual-signed card. Combinations for the Mystery Redemptions haven't been announced. 2011-12 Upper Deck SP Authentic HOBBY Box (Ryan Nugent-Hopkins RC Patch Auto)? 2011-12 SP Authentic Factory Sealed Hockey Hobby Box Nugent-Hopkins AUTO RC?